Directly descended from the battle horses of medieval times, the Belgian draft horse is a breed known for its hard-working and amiable personality and distinctive coloring. Like all draft horses, Belgians are tall and extremely muscular. Though typically thought of primarily as farm horses, Belgians demonstrate versatility in many disciplines. As its name implies, the Belgian horses were first bred in Belgium and are descendants of the so-called “great horses” used by medieval knights in battle. Because of the very fertile soil, Belgians had an abundance of hay and grain with which to produce this large, powerful breed. In the late 19th century, Belgium was regularly exporting these horses all over Europe and they slowly became popular in America after an appearance at the St. Louis World Fair in 1903. Originally bred by farmers, the Belgian horse was historically used on farms for agriculture and in cities along other draft breeds in warehouses and freight stations and warehouses. Today, Belgian horses are still used for farming although its versatility makes the breed suitable for forestry work and pleasure driving. A typical Belgian horse can pull a load of up to 8,000 lbs. and work a full eight- to 10-hour day. While their large build makes them inappropriate for competition in riding disciplines like jumping or dressage, they can be a fun mount for casual or trail riding. According to the Belgian Horse Corporation, the Belgian horse is "an easy keeper, a good shipper, and a willing worker." EquiSearch notes their reputation for being kind and easy to handle. Almost all Belgian horses boast the same sorrel-colored coat with a white mane and tail. The early part of the 20th century saw many bay and roan Belgians, but since then they’ve been bred for the more desirable sorrel color and this is by far the most dominant color in the breed. They stand 16 to 18 hands (64 to 72 inches) at the withers, the crest of the shoulder. Like all draft breeds, they are thick and powerful horses. American Belgian horses are bred for long, sloping shoulders and pasterns. 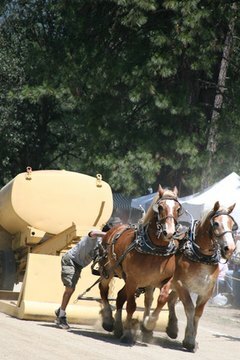 According to the Belgian Draft Horse Corporation of America, Belgians are the most popular draft horse in the United States. Thanks to their kind temperament, they are even becoming more popular as riding horses.